XQuery is a language for traversing XML documents to select and aggregate items of interest and to transform them for output as XML or some other format. XPath is the element selection part of XQuery. The Qt XML Patterns module supports using XQuery 1.0 and XPath 2.0 in Qt applications, for querying XML data and for querying non-XML data that can be modeled to look like XML. Readers who are not familiar with the XQuery/XPath language can read A Short Path to XQuery for a brief introduction. First, the query opens a <bibliography> element in the output. The embedded path expression then loads the XML document describing the contents of the library (library.xml) and begins the search. For each <book> element it finds, where the publisher was Addison-Wesley and the publication year was after 1991, it creates a new <book> element in the output as a child of the open <bibliography> element. Each new <book> element gets the book's title as its contents and the book's publication year as an attribute. Finally, the <bibliography> element is closed. Ease of development: All the C++ programming required to perform data query tasks can be replaced by a simple XQuery like the example above. Comprehensive functionality: The expression syntax and rich set of functions and operators provided by XQuery are sufficient for performing any data searching, selecting, and sorting tasks. Conformance to standards: Conformance to all applicable XML and XQuery standards ensures that Qt XML Patterns can always process XML documents generated by other conformant applications, and that XML documents created with Qt XML Patterns can be processed by other conformant applications. Maximal flexibility The Qt XML Patterns module can be used to query XML data and non-XML data that can be modeled to look like XML. There are two ways Qt XML Patterns can be used to evaluate queries. You can run the query engine in your Qt application using the Qt XML Patterns C++ API, or you can run the query engine from the command line using Qt's xmlpatterns command line utility. First construct a QFile for the text file containing the XQuery (myquery.xq). Then create an instance of QXmlQuery and call its setQuery() function to load and parse the XQuery file. Then create an XML serializer to output the query's result set as unformatted XML. Finally, call the evaluateTo() function to evaluate the query and serialize the results as XML. Note: If you compile Qt yourself, the Qt XML Patterns module will not be built if exceptions are disabled, or if you compile Qt with a compiler that doesn't support member templates, e.g., MSVC 6. See the QXmlQuery documentation for more information about the Qt XML Patterns C++ API. xmlpatterns is a command line utility for running XQueries. It expects the name of a file containing the XQuery text. The XQuery in myQuery.xq will be evaluated and its output written to stdout. Pass the -help switch to get the list of input flags and their meanings. xmlpatterns can be used in scripting. However, the descriptions and messages it outputs were not meant to be parsed and may be changed in future releases of Qt. XQuery represents data items as atomic values or nodes. An atomic value is a value in the domain of one of the built-in datatypes defined in Part 2 of the W3C XML Schema. A node is normally an XML element or attribute, but when non-XML data is modeled to look like XML, a node can also represent a non-XML data items. When you run an XQuery using the C++ API in a Qt application, you will often want to bind program variables to $variables in the XQuery. After the query is evaluated, you will want to interpret the sequence of data items in the result set. When you want to run a parameterized XQuery from your Qt application, you will need to bind variables in your program to $name variables in your XQuery. A type not shown in the table is not supported and will cause undefined XQuery behavior or a $variable binding error, depending on the context in the XQuery where the variable is used. Because the instance of QTime used in QVariant::Time does not include a zone offset, an instance of QVariant::Time should not be bound to an XQuery variable of type xs:time, unless the QTime is UTC. When binding a non-UTC QTime to an XQuery variable, it should first be passed as a string, or converted to a QDateTime with an arbitrary date, and then bound to an XQuery variable of type xs:dateTime. A QVariantList can be bound to an XQuery $variable. All the QVariants in the list must be of the same atomic type, and the $variable the variant list is bound to must be of that same atomic type. If the QVariants in the list are not all of the same atomic type, the XQuery behavior is undefined. To access the strings in a QXmlName returned by an XQuery evaluation, the QXmlName must be accessed with the name pool from the instance of QXmlQuery that was used for the evaluation. An instance of xs:time can't be represented correctly as an instance of QVariant::Time, unless the xs:time is a UTC time. This is because xs:time has a zone offset (0 for UTC) in addition to the time value, which the QTime in QVariant::Time does not have. This means that if an XQuery tries to return an atomic value of type xs:time, an invalid QVariant will be returned. A query can return an atomic value of type xs:time by either converting it to an xs:dateTime with an arbitrary date, or to an xs:string. Although the XQuery language was designed for querying XML, with Qt XML Patterns one can use XQuery for querying any data that can be modeled to look like XML. Non-XML data is modeled to look like XML by loading it into a custom subclass of QAbstractXmlNodeModel, where it is then presented to the Qt XML Patterns XQuery engine via the same API the XQuery engine uses for querying XML. When Qt XML Patterns loads and queries XML files and produces XML output, it can always load the XML data into its default XML node model, where it can be traversed efficiently. The XQuery below traverses the product orders found in the XML file myOrders.xml to find all the skin care product orders and output them ordered by shipping date. The File System Example does exactly this. There is no such file to load into the default XML node model, but one can write a subclass of QAbstractXmlNodeModel to represent the file system. This custom XML node model, once populated with all the directory and file descriptors obtained directly from the system, presents the complete file system hierarchy to the query engine via the same API used by the default XML node model to present the contents of an XML file. In other words, once the custom XML node model is populated, it presents the file system to the query engine as if a description of it had been loaded into the default XML node model from an XML file like the one shown above. Now we can write an XQuery to find all the XML files and parse them to find the ones that don't contain well-formed XML. Without Qt XML Patterns, there is no simple way to solve this kind of problem. You might do it by writing a C++ program to traverse the file system, sniff out all the XML files, and submit each one to an XML parser to test that it contains valid XML. The C++ code required to write that program will probably be more complex than the C++ code required to subclass QAbstractXmlNodeModel, but even if the two are comparable, your custom C++ program can be used only for that one task, while your custom XML node model can be used by any XQuery that must navigate the file system. The general approach to using XQuery to perform queries on non-XML data has been a three step process. In the first step, the data is loaded into a non-XML data model. In the second step, the non-XML data model is serialized as XML and output to XML (text) files. In the final step, an XML tool loads the XML files into a second, XML data model, where the XQueries can be performed. The development cost of implementing this process is often high, and the three step system that results is inefficient because the two data models must be built and maintained separately. With Qt XML Patterns, subclassing QAbstractXmlNodeModel eliminates the transformation required to convert the non-XML data model to the XML data model, because there is only ever one data model required. The non-XML data model presents the non-XML data to the query engine via the XML data model API. Also, since the query engine uses the API to access the QAbstractXmlNodeModel, the data model subclass can construct the elements, attributes and other data on demand, responding to the query's specific requests. This can greatly improve efficiency, because it means the entire model might not have to be built. For example, in the file system model above, it is not necessary to build an instance for a whole XML file representing the whole file system. Instead nodes are created on demand, which also likely is a small subset of the file system. See the QAbstractXmlNodeModel documentation for information about how to implement custom XML node models. Subclassing QAbstractXmlNodeModel to let the query engine access non-XML data by the same API it uses for XML is the feature that enables Qt XML Patterns to query non-XML data with XQuery. It allows XQuery to be used as a mapping layer between different non-XML node models or between a non-XML node model and the built-in XML node model. Once the subclass(es) of QAbstractXmlNodeModel have been written, XQuery can be used to select a set of elements from one node model, transform the selected elements, and then write them out, either as XML using QXmlQuery::evaluateTo() and QXmlSerializer, or as some other format using a subclass of QAbstractXmlReceiver. Consider a word processor application that must import and export data in several different formats. Rather than writing a lot of C++ code to convert each input format to an intermediate form, and more C++ code to convert the intermediate form back to each output format, one can implement a solution based on Qt XML Patterns that uses simple XQueries to transform each XML or non-XML format (e.g. MathFormula.xml below) to the intermediate form (e.g. 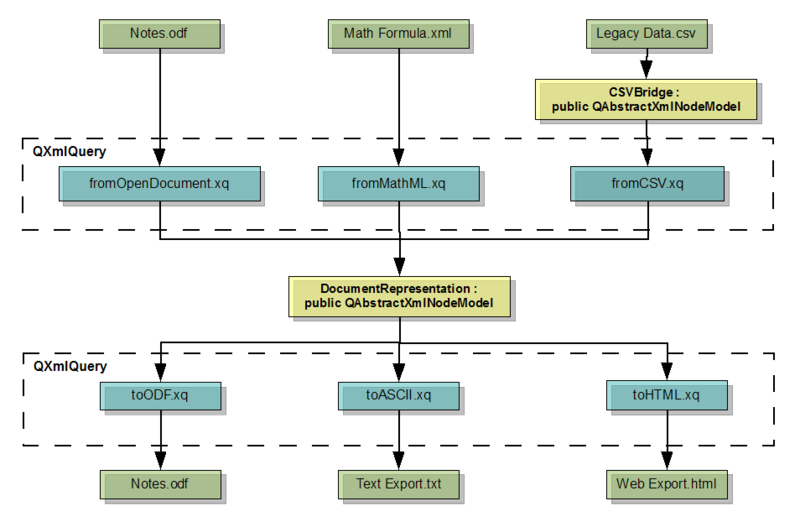 the DocumentRepresentation node model class below), and more simple XQueries to transform the intermediate form back to each XML or non-XML format. Because CSV files are not XML, a subclass of QAbstractXmlNodeModel is used to present the CSV data to the XQuery engine as if it were XML. What are not shown are the subclasses of QAbstractXmlReceiver that would then send the selected elements into the DocumentRepresentation node model, and the subclasses of QAbstractXmlNodeModel that would ultimately write the output files in each format. XQuery is vulnerable to code injection attacks in the same way as the SQL language. If an XQuery is constructed by concatenating strings, and the strings come from user input, the constructed XQuery could be malevolent. The best way to prevent code injection attacks is to not construct XQueries from user-written strings, but only accept user data input using QVariant and variable bindings. See QXmlQuery::bindVariable(). The articles Avoid the dangers of XPath injection, by Robi Sen and Blind XPath Injection, by Amit Klein, discuss the XQuery code injection problem in more detail. Applications using Qt XML Patterns are subject to the same limitations of software as other systems. Generally, these can not be checked. This means Qt XML Patterns does not prevent rogue queries from consuming too many resources. For example, a query could take too much time to execute or try to transfer too much data. A query could also do too much recursion, which could crash the system. XQueries can do these things accidentally, but they can also be done as deliberate denial of service attacks. Some corner cases involving namespaces and element constructors are incorrect. XPath is a subset of XQuery and the implementation of Qt XML Patterns uses XPath 2.0 with XQuery 1.0. The specifications discusses conformance further: XQuery 1.0: An XML Query Language. W3C's XQuery testing effort can be of interest as well, XML Query Test Suite. Currently fn:collection() does not access any data set, and there is no API for providing data through the collection. As a result, evaluating fn:collection() returns the empty sequence. We intend to provide functionality for this in a future release of Qt. Only queries encoded in UTF-8 are supported. For details, see XSL Transformations (XSLT) Version 2.0, 21 Conformance. Note: In this release, XSLT support is considered experimental. Unsupported or partially supported XSLT features are documented in the following table. The implementation of XSLT in Qt 4.5 can be seen as XSLT 1.0 but with the data model of XPath 2.0 and XSLT 2.0, and using the using the functionality of XPath 2.0 and its accompanying function library. When Qt XML Patterns encounters an unsupported or partially support feature, it will either report a syntax error or silently continue, unless otherwise noted in the table. The implementation currently passes 42% of W3C's XSLT test suite, which focus on features introduced in XSLT 2.0.
xsl:copy The copy-namespaces and inherit-namespaces attributes have no effect. For copied comments, attributes and processing instructions, the copy has the same node identity as the original. xsl:copy-of The copy-namespaces attribute has no effect. Patterns Complex patterns or patterns with predicates have issues. 2.0 Compatibility Mode Stylesheets are interpreted as XSLT 2.0 stylesheets, even if the version attribute is in the XSLT source is 1.0. In other words, the version attribute is ignored. Grouping fn:current-group(), fn:grouping-key() and xsl:for-each-group. Date & Time formatting fn:format-dateTime(), fn:format-date() and fn:format-time(). XPath Conformance Since XPath is a subset of XSLT, its issues are in affect too. The Qt XML Patterns implementation of the XPath Data Model does not include entities (due to QXmlStreamReader not reporting them). This means that functions unparsed-entity-uri() and unparsed-entity-public-id() always return negatively. Regular expression support is currently not conformant but follows Qt's QRegExp standard syntax. Operators for xs:time, xs:date, and xs:dateTime are incomplete. Formatting of very large or very small xs:double, xs:float, and xs:decimal values may be incorrect. Processing of XML files supports xml:id. This allows elements that have an attribute named xml:id to be looked up efficiently with the fn:id() function. See xml:id Version 1.0 for details. There are two ways Qt XML Patterns can be used to validate schemas: You can use the C++ API in your Qt application using the classes QXmlSchema and QXmlSchemaValidator, or you can use the command line utility named xmlpatternsvalidator (located in the "bin" directory of your Qt build). Large minOccurs or maxOccurs values or deeply nested ones require huge amount of memory which might cause the system to freeze. Such a schema should be rewritten to use unbounded as value instead of large numbers. This restriction will hopefully be fixed in a later release. Comparison of really small or large floating point values might lead to wrong results in some cases. However such numbers should not be relevant for day-to-day usage. Identity constraint checks can not use the values of default or fixed attribute definitions. data The bytes are encoded in the URI itself. e.g., data:application/xml,%3Ce%2F%3E is <e/>. ftp Resources retrieved via FTP. http Resources retrieved via HTTP. https Resources retrieved via HTTPS. This will succeed if no SSL errors are encountered. qrc Qt Resource files. Expressing it as an empty scheme, :/..., is not supported. XML 1.0 and XML Namespaces 1.0 are supported, as opposed to the 1.1 versions. When a strings is passed to a query as a QString, the characters must be XML 1.0 characters. Otherwise, the behavior is undefined. This is not checked. URIs are first passed to QAbstractUriResolver. Check QXmlQuery::setUriResolver() for possible rewrites.